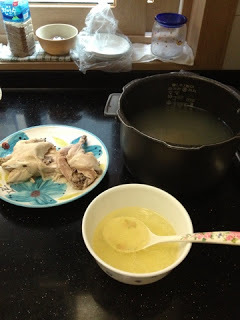 Well it's the hot and humid summer season in Korea right now and that means that stewing chickens are on sale for 2,000 KRW ($2.00 US) so I've been making a lot of chicken porridge (jook) for my little guy. 1 chicken yields around 2-3 weeks worth of broth and meat for a nutritious and tasty baby food . 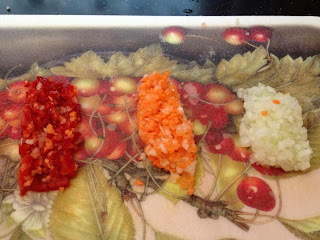 I used my rice cooker for this recipe but if you don't have one you can use a pressure cooker or use the method shown here on Aeri's Kitchen. There are two phases to making rice porridge this way. The first is to boil the chicken for broth and meat and the second is to cook the porridge. 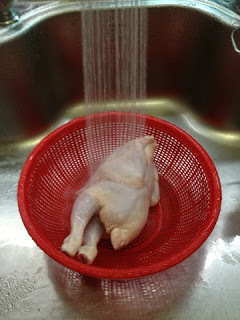 First rinse the spring chicken thoroughly with cold water. Do the same for the jujubes, ginseng, and any other ingredients that you are using. 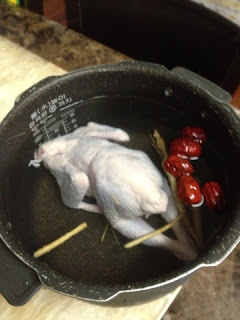 Place the chicken, ginseng, and jujubes in the rice cooker and add enough water so that it completely covers the chicken. Do not exceed the water maximum in your cooker. I used about 2 liters of water. Turn the rice cooker on and find the Menu button. 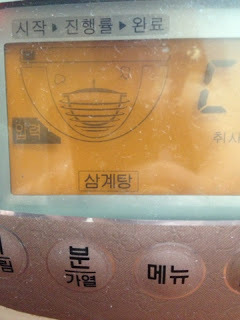 For those of you using a Korean rice cooker press the 메뉴 button until the Samgaytang 삼계탕 button is highlighted. Press start. If you do not have a samgaytang button try the steam 찜 button. The cooking time will take 1.5 to 2 hours. Once the chicken is done, remove it from the broth and let it cool. Skim all the fat from the top of the broth. I got about 1 cup of fat skim. Toss it. 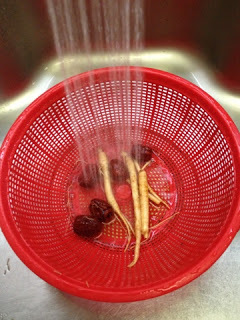 Strain the broth and toss the garlic, ginseng, and jujubes. Let the broth cool and then bag it. 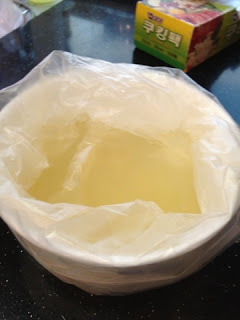 You can use breast milk storage bags, you can freeze it in ice cube trays, or you can simply put the broth into plastic bags. I put two bags together and then put them around a medium-sized bowl. 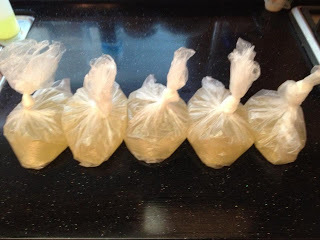 I then poured 500 ml (2 cups) of broth into the bags, tied them up, and then put them into the freezer. I got 4 500 ml bags of broth and 1 300 ml bag. 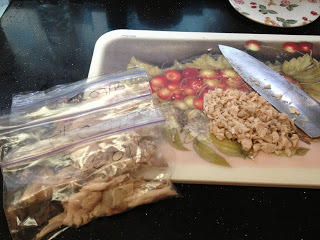 Chop up the chicken and store it in plastic bags as well. 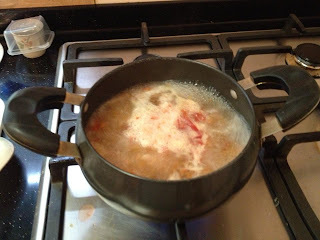 I got 4 portions of chicken from the bird which was 500 g.
Pour the broth into a pot and bring to a boil. Add the finely chopped veggies and cook for 5 minutes. Add the chicken and cooked rice. 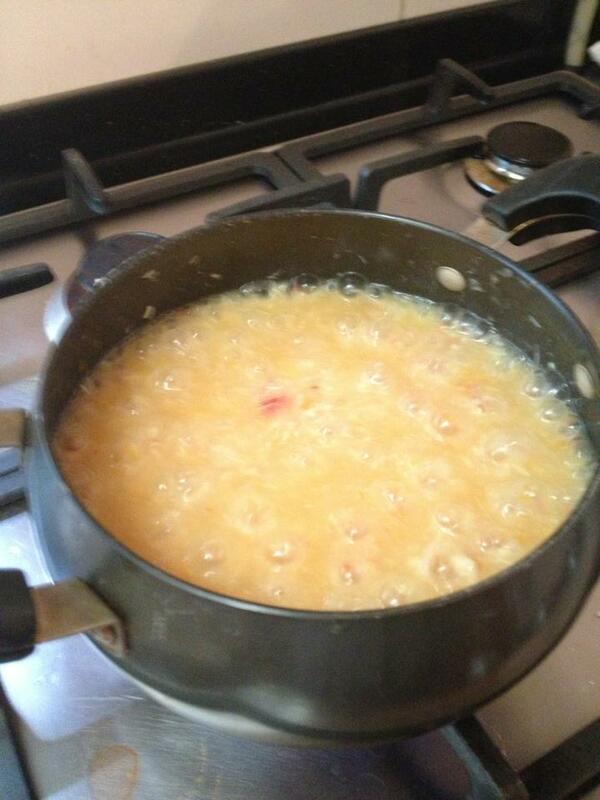 On a good medium heat boil the porridge for 5 minutes stirring constantly. Stop when you have reached a desired consistency. 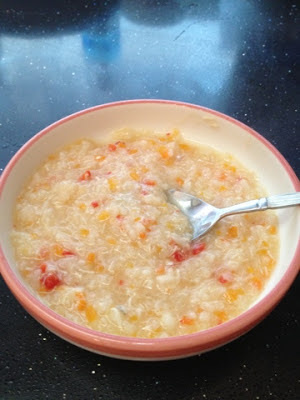 If your porridge seems too thick add a bit more broth or water. If it is too thin add another Tbsp of rice and bring to a boil again. 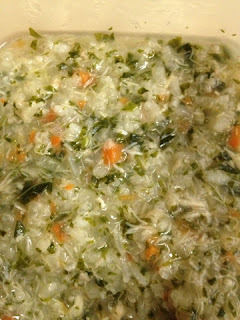 Store the cooled down porridge in a container and refrigerate for 3-4 days maximum. To reheat the porridge, add a few Tbsp of it to a pot and a little water or broth and bring it to a boil. There you have it, super tasty baby food on a budget. *** Note: When giving your baby jook make sure that you also give him/her a lot of water. If your baby is not taking the water cup well, spoon-feed water. I usally give my son 1 spoon of water for every 2 spoons of jook. Thank you for this. I plan on making this for my 9 month old. Ill probably make the chicken and veggies finger food size.